Depending on when you read this, I’m either settled as comfortable as possible (read: swathed in a pashmina with an eye mask at-the-ready) or just about to head to the airport at an unholy hour for my 6 a.m. flight. (2) Emphasis on the aforementioned unholy hours. Pulling an all-nighter to make this flight means puffy eyes, dark circles, redness, and any other lovely thing that comes with lack of sleep. This two-hour flight is now all I have for a power nap plus intense beauty treatment so I can land looking ready and well-rested for what’s to come. The Cucumber Cleansing Lotion is the first thing I’ll use once I’ve buckled up and settled in. It’s super refreshing and helps keep T-zone shine at bay – and doesn’t require trekking to a restroom. (another thing I’m adverse to: airplane bathrooms, ick). After I’ve “cleansed,” I start building up layers of hydration to keep my skin nourished despite the less-than-ideal conditions. I begin with a few drops of my favorite Vitamin C Serum to help encourage my skin’s natural luminosity – it’s the secret to leaving the plane looking fresh-faced and dewy! – and layer over it with a generous application of the AHA & Ceramide Moisturizer. It’s yet another product meant to help rejuvenate dull, congested complexions. To finish, I pat a few drops of the Rose Hips Nourishing Oil wherever I’m prone to dryness first – between the brows, tops of the cheeks, and around the nose. To take care of the puffy, tired eyes situation I will most definitely have going on, the Hyaluronic Eye Cream will help replenish moisture and nourish the delicate under-eye area. Lips! Lips are always important! Yes, I’ll be guzzling water so long as I’m awake (but you know – not too much where I’m forced to navigate the aisles to the dreaded BR), but H20 isn’t enough. Your lips are the first to dry out because the skin is thinnest there, so I slather on lip balm like there’s no tomorrow. Tone again. Do you hear your skin exhaling with relief? It’s the perfect pick-me-up. I’ll moisturize again before generously spritzing my face and décolletage with the Rosewater Facial Spray to refresh and revive my complexion. It does wonders in creating an instant glow. To further recreate the look of the well-rested, I’ll curl my lashes to help open up the eyes and swipe on a few coats of mascara. Reapply a light layer of lip balm before finishing with a glossy lip pencil or gloss to bring color to my face. Et voila! Fresh-faced and ready for that weekend getaway. Booking a long-haul flight? 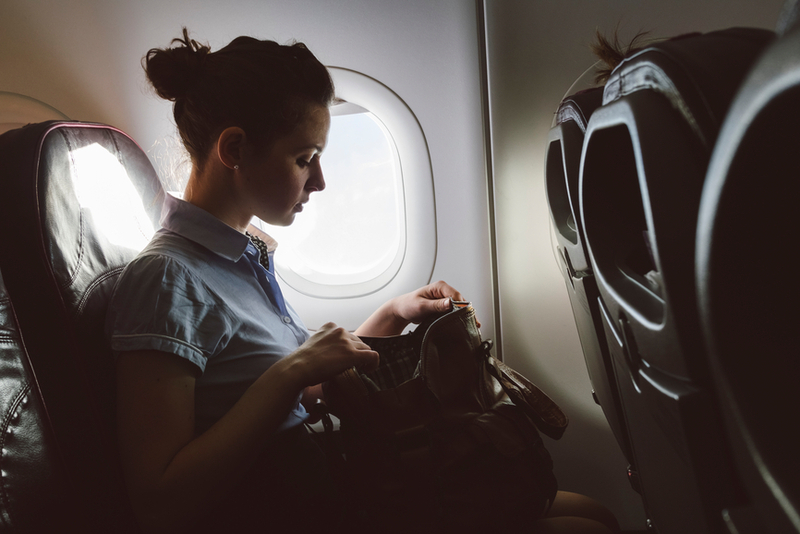 Read up on our skincare regimen for long flights (and road trips).